Naata is about Bhau Korde and Waqar Khan, two activists and friends, who have been involved in conflict resolution, working with neighbourhood peace committees in Dharavi, Mumbai, reputedly, the largest 'slum' in Asia. This film explores their work, which has included the collective production and use of visual media for ethnic amity. Waqar and Bhau's work raises several uncomfortable questions for the filmmakers, so-called modern, middle-class, secular, urban beings. Naata juxtaposes the multi-layered narrative on Dharavi and the 'stories' of the filmmakers, thereby attempting to foreground a critical and active viewership. The idea of making this film grew out of our interaction with Bhau and Waqar and their work. We felt that this story of how Waqar, Bhau and the people of Dharavi have, on their own accord, produced and used various media materials for communal amity (ranging from posters to videos and audio cassettes) had an important lesson for all of us, in these troubled times. We feel that in our present fractured world, it is crucial to share stories of hope and struggle, stories that give us the courage to go on. We also wanted to explore the language of a non-confrontational dialogue with the viewer that gently prompts him/her to look within, to reflect on personal prejudice. As Asia�s largest slum, with a population of about 800,000, Dharavi has often been represented as a breeding ground for filth, vice and poverty, full of �migrants�, whose right to live in the city is often questioned by vigilante citizens� groups and right-wing politicians. The film attempts to question these dominant representations of Dharavi in the popular imagination. Dharavi is shown as having a long history, with migration taking place from the late 19th century. It is a productive space and plays an important role in the economy of the city, as it is one of the major hubs of the informal sector that produces commodities ranging from food products to leather goods that cater to a large export market. The film pays tribute to this creativity, vitality and enterprise of Dharavi. We felt that the sheer energy and inclusiveness of informal grass-roots initiatives for communal amity raises several uncomfortable questions for us, so-called modern, middle-class, secular, urban beings, which we need to reflect on. We thought that the film needed to move beyond a �feel good� story of the impressive work being done by Bhau, Waqar and the citizens of Dharavi. Hence, in terms of the structure of the film, we have introduced an element of reflection, through �our� stories which could possibly lead to a critical and active viewership. These, we thought, will be spaces for the audience to reflect on their own �stories�. 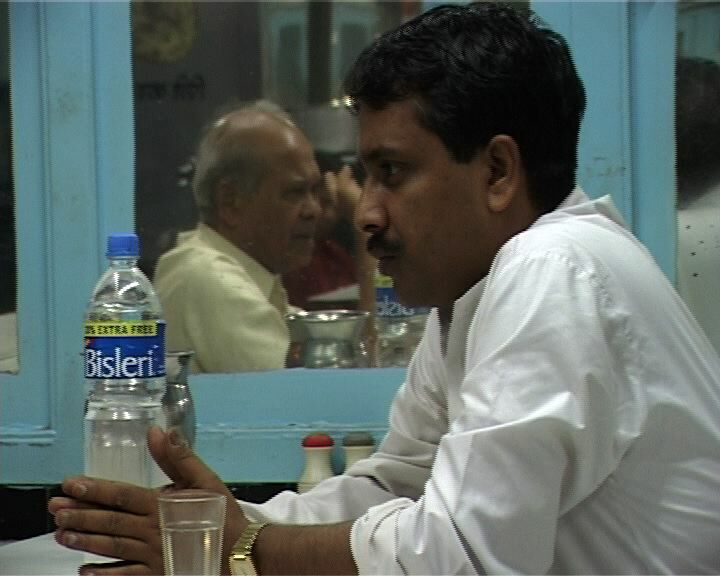 Monteiro and Jayasankar�s Naata is about Bombay, and about Dharavi, the city�s most economically efficient neighbourhood, but the heart of the story lies with two extraordinary citizens, Waqar Khan and Bhau Korde and the making of their film, Ekta Sandesh. ... Added her husband and colleague K P Jayasankar, "We wanted to use this relationship to explore the changes in Mumbai, http://timesofindia.indiatimes.com/articleshow/msid-112729,prtpage-1.cms? Anjali Monteiro is Professor, and K.P. Jayasankar is Professor and Chair, Centre for Media and Cultural Studies, Tata Institute of Social Sciences. Monteiro has a Masters degree in Economics and a Ph.D. in Sociology. Jayasankar has an M.A. in German language and a Ph.D. in Humanities and Social Sciences. Both of them are involved in media production, teaching and research. Jointly they have won thirteen national and international awards for their videos. These include the Prix Futura Berlin 1995 Asia Prize for Identity- The Construction of Selfhood and a Special Mention of the Jury at MIFF `96 for Kahankar: Ahankar, the Certificate of Merit at MIFF `98 and Best Innovation, Astra Film Festival 1998, Sibiu, Romania for YCP 1997 and the Second Prize for Saacha at the New Delhi Video Forum 2001. A presiding thematic of much of their work has been a problematising of notions of self and the other, of normality and deviance, of the local and the global, through the exploration of diverse narratives and rituals. These range from the stories and paintings of indigenous peoples to the poetry of prison inmates. They are currently working on a series of films on the city of Mumbai. The Plot Thickens: A Cultural Studies Approach to Media Education in India, in Lavender, T et al eds., Global Trends in Media Education, Hampton Press, 2003. They are both recipients of the Association of Commonwealth Universities� Howard Thomas Memorial Fellowship in Media Studies, and have been attached to Goldsmith�s College, London and the University of Western Sydney. They also serve as visiting faculty to several leading media and design institutions across India, such as Asian College of Journalism, Chennai, National Institute of Design, Ahmedabad and University of Hyderabad. 1986, U-matic (PAL), 50 mins. 1987, U-matic (PAL), 60 mins. 1987, U-matic (PAL), 1 hrs. 40 mins. 1990, U-matic (PAL), 44 mins. 1991, U-matic (PAL), 30 mins. 1993, U-matic (PAL), 21 mins. 1992, U-matic (PAL), 16 mins. 1993, U-matic(PAL), Col., 23 mins. 2nd prize in the Health and Population category at the International Video Festival, Thiruvananthapuram, Sept. 1995. 1993, U-matic (PAL), 14 min. First Prize and the Award for Individual Technical Excellence in Editing at the Sixth UGC Country-wide Classroom Video Festival 1993, Calcutta. 2nd prize in the Education and Literacy category at the International Video Festival, Thiruvananthapuram, Sept. 1995. 13th World Wide Video Festival, April 1995. 1995, U-matic (PAL), 38 mins. Certificate of Merit, Mumbai International Film Festival (MIFF)1998 and the Jury�s Award for Best Innovation, Astra Festival of Anthropological Documentary Film, Sibiu, Romania, 1998. Second Prize, New Delhi Video Forum, 2001.